Where I live in the South, there has been an oppressive heat wave for many days, and other parts of the country are also experiencing high temperatures. The challenge is to make your training enjoyable, productive, and safe during hot weather. First, try to ride early in the morning or late in the evening to avoid the highest temperatures of the day. The morning hours are preferable because you have the benefit of the cooler night air preceding them, so the air feels fresher and, in the case of the South, less humid. When you’ve finished riding, let the horse walk on a loose rein for a few minutes to cool down. Then give it a quick bath, use a sweat scraper to remove excess water, and, if the animal is still hot to the touch, walk it until it is no longer producing steam and its body temperature feels normal under your hand. You can then let the animal graze on a lead line until its coat is dry. If the horse is put into the stall wet, it usually has a hard time drying out, so it begins to roll in the shavings or straw to dry its coat. This makes a big mess and can result in the horse getting “cast” in the stall—that is, as it rolls, its feet get stuck against a wall. In this case, the horse sometimes can’t get its feet off the wall without assistance. There has been a lot of debate about the temperature of water given to a horse after work—both water that is drunk by the horse and water that is used to bath the animal. There are times when very cold water is used on key places on a horse to bring its temperature down, for instance, during the cross country day of a three-day event. However, horses are not usually reaching extreme temperatures after a routine workout, so in general I would say to bathe a horse in tepid water after a workout. At a show, I usually leave buckets of water in the sunlight so that the water heats naturally. Even though a hose may be available, it won’t necessarily have anything but cold water to offer, and there is always the chance that you’ll have a hot horse needing a bath at the same time that many other people do, so the buckets are a smart insurance policy. I think the temperature of the water is also an issue of trust. You don’t want the water to be cold enough that it makes the horse dance around in evasion. If that is the case, the animal begins to realize that you are not a kind person, and it remains overly alert to see what else you might do that is thoughtless. That is a terrible relationship that spills over into everything else you do with the horse, both mounted and unmounted. No matter what the temperature of the air, the bath water should be comfortable and put the animal at ease. As for drinking water following a bath, either tepid or cool water is fine, but as a rule of thumb, let the horse have no more than half of the typical five-gallon bucket at first, then walk the horse in a large circle (some people walk all the way around the barn), allowing it to take a sip every time it approaches the bucket until it is no longer interested in drinking. The key thing here is to keep the horse moving as it is cooling down. A slow cool-down is always the smartest thing. Once the horse’s body temperature is cool to the touch, you can let the animal graze. This is a nice reward for a horse that has finished a work session and allows the coat to completely dry. For those of you who don’t already know, there is a wonderful online resource at http://www.equestriancoach.com/ , created by well-respected horseman, Bernie Traurig. The site provides video instruction by Traurig and many other fine riders, including John French, Rodrigo Pessoa, Denny Emerson, Will Simpson, Peter Pletcher, Zazou Hoffman, and Missy Clark, to name a few. The monthly fee is $29.99 or you can get 12 months for the price of 10 by paying an annual fee of $299.99. Videos can be purchased separately for $8.99 each. This site is an extraordinary opportunity for riders and coaches to get important training and showing information from “the best of the best,” and I hope that many of you will seize this opportunity. Bernie is one of the few riders in the world to successfully compete on an international level in three disciplines—Show Jumping, Dressage, and Eventing. As a Junior, Bernie won both the American Horse Shows Association Medal Finals and The American Society for The Prevention of Cruelty to Animals Maclay Finals. He was a member of the United States Three Day Event team for three years and was second in the trials for the 1964 Olympic Games in Tokyo. Bernie has ridden many National Working Hunter Champions. Some of the more famous include “Gozzi,” “Royal Blue,” “Riot Free,” and “Circuit Breaker,” In the Dressage Sport, he was the winner of 15 Grand Prix’s and Grand Prix Special classes. He was short listed for the 1986 World Championship trials and the 1988 Olympic Games. He is the winner of 48 Show Jumping Grand Prix’s. 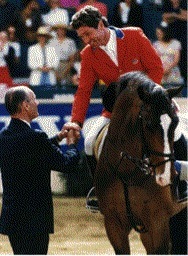 Bernie represented the United States Equestrian Show Jumping Team several times, including the 1982 World Championships in Dublin, Ireland. He competed in six World Cup Finals, finishing fifth in Del Mar, California, in 1992 as the highest placing American rider, and eighth in Dortmund Germany in 1990. He was the winner of the US League qualifying for the World Cup Finals three times.